This entry is written from a more personal perspective than the previous, because I can only speak for myself about the feelings and thoughts that the visit to Lunik IX evoked. In the span of the two years, during which I planned aspects of this study abroad program, the visit to the settlements in eastern Slovakia were most contentious – from the point of view of safety on the part of the University of Pittsburgh staff to the notion of appropriateness from the perspective of my Czech colleague, Dr. Zuzana Jurkova from Charles University in Prague, who is co-teaching this course, and my personal convictions regarding the importance of sharing my experiences in impoverished settlements with my students. Alongside ethical issues, our concern focused on the logistics of bringing a group of more than 20 people into a Roma community. What would we do when we were in the settlement? How would we be perceived? What was our motivation in going? What would be the benefits for the community and for us? These issues became pressing as time went on and contacts to the settlements fell through or could not be established to accommodate a big group. The kindergarten in Lunik IX, used to welcoming international visitors due to its award-winning emphasis on art (our visit was preceded by a visit from Amnesty International the week before), agreed to host us, and we arrived in Lunik IX, near Kosice, Slovakia, by bus from Tarnow, Poland, at mid-morning to be with the children before they had their lunch and took naps. The children were to sing for us, and in turn, we brought our instruments to play and sing for them. Traveling with a big group on a bus is not the ideal way to arrive anywhere, because it smacks of tourism and cultural insensitivity and naivete. Sometimes, however, one simply has to get over it and do what one has to do to create an experience. Our bus dropped us off where the Kosice city bus stops to bring workers home to Lunik IX. We decided as a group to only take three cameras and decided ahead of time who would be in charge of photography and who in charge of video recording. We walked up a hill past the socialist-era housing that has become the iconic image of Lunik IX on the internet. These complexes were built in the 1970s with plumbing and electricity for Roma who were pushed out of housing in other parts of Kosice. Since the 1970s, the buildings have fallen into disrepair. Two buildings have been condemned, and a third will be pulled down soon. Those who were once living in the buildings that were torn down have been forced to find shelter elsewhere, whether with family in other communities, or abroad. 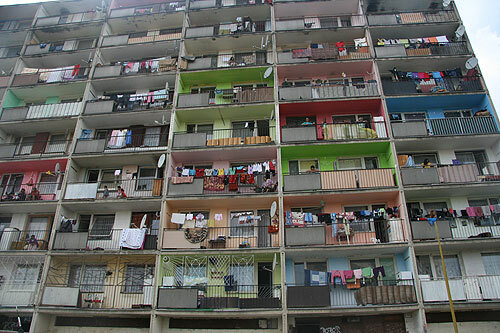 Some say that all the buildings in Lunik IX will be torn down eventually, and it will cease to exist as a community. Only those who pay their rent regularly will be offered housing in other parts of the city. The 5,000-7,000 Roma who live in Lunik IX reside in terrible conditions, often without electricity and water because they cannot afford to pay for the utilities. There is a city official who stays at Lunik IX during the day to turn on utilities for those who pay, if only for one day at a time. There is no hot water in the apartments, and cold water is available for those who pay, but for only two hours every day. There was much nervousness and a feeling of awkwardness as we walked along the paved road towards the kindergarten. We were met by the city official in charge of turning on utilities at the edge of the housing complex. He inquired about our purpose and then led us to the kindergarten as he, much to our surprise, searched for the keys. We wondered, why is the kindergarten locked? Have we misunderstood when we were supposed to come? The kindergarten entrance that led onto a grassy field next to the apartment buildings seemed to be protected by a cage-like structure with bars through which we entered. The city official had opened the outside door of the cage and had unlocked the kindergarten door from the outside. A woman met us at the door and proceeded to unlock a third (!) door that led us into the kindergarten, where we were met by smiling children. Children who cannot afford to attend the kindergarten peer through the bars that "protect" the entrance to the school. The kindergarten is quite an impressive complex, with three floors and numerous hallways and doors, each unlocked as we passed through. The windows were covered with grates and mesh, and a long hallway that at one time had windows, was protected by steel paneling donated by Pittsburgh-based U.S. Steel, which has a plant in Kosice, Slovakia. (Kosice was a center of steel production) The panels shut out all light, but the hallway was decorated with the most beautiful and creative artwork done by the students. The hallway’s artwork was divided into four seasons featuring pieces in a variety of mediums. In fact, when we asked what we could bring the kindergarten as a token of our visit, they asked for art supplies. We brought markers, colored pencils, crayons, and a variety of other drawing materials that we had purchased in Krakow in preparation for the visit. Our students had brought candy from the U.S., as well, and this was deposited into a big bag from which the young students will receive treats. 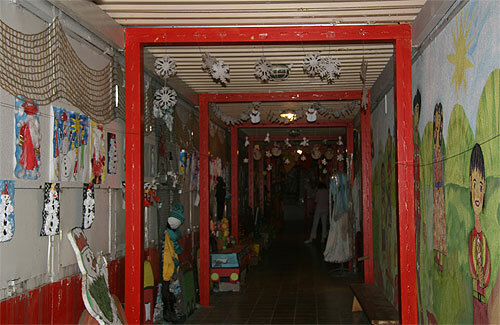 The window-less hallway of the kindergarten built by panels donated by U.S. Steel (Pittsburgh, PA/Kosice, Slovakia) is decorated by award-winning student artwork. As we walked through the numerous classrooms, it was clear that the kindergarten teachers care very deeply for the children and work very hard to procure materials for the school. Though the school is funded by the state, there is an additional tuition of 10 Euro a month to attend to help pay for supplies. The students receive breakfast and lunch and pay 0.23 cents (Euro) for a light snack and dinner per day. This is, however too expensive for some families. Those who cannot afford to send their children to the kindergarten send them to other schools, while other parents, mothers in particular, pay for tuition through a work-exchange program with the school, helping with tasks such as maintenance, cleaning, and other jobs. The school employs two Roma cooks and had a Roma teacher, but the pay is only 450 Euros a month after one has worked there for 25 years, so not many can afford to work there at entry-level pay if they can find a better paying job elsewhere. Most teachers, including the principal are non-Roma women who choose to work there because they love the work and the children. They write grants to IBM to get computers into the classroom and to other companies and organizations to help cover costs. The students seem very familiar with computers, and in one of the older classrooms, a 6-year-old boy ran to the computer to start a karaoke mp3 of a song that the students danced and sang for us. The songs we heard were in Romani and Slovak, with teachers often creating new songs by adding Romani words to Slovak folk melodies. Language is a very critical issue in the school, because some parents feel strongly that the school should only teach Slovak. In this way, the students, who speak Romanes at home, can be prepared to enter the Slovak-language grammar school down the hill from the settlement. Though we were at the settlement in the middle of the day, a large number of children were playing outside and were not in school, but it seemed that these were the children of those who could not afford to send their children to school. The principal of the kindergarten says that those who have attended the kindergarten do better in school, and that many of the students she has taught in her 16 years at the school have finished university. We enjoyed listening to the students sing for us, and then it was our turn to sing for the children. They had been dancing to their songs, and the only one in our “repertoire” that matched the feel and rhythm was, ironically, Gogol Bordello’s “Start Wearing Purple,” a take on “Gypsy” music by Ukrainian-born Eugene Hutz, complete with affected Eastern European accent and nonsensical lyrics. It was made famous in movies like “Borat” and “Everything is Illuminated.” I doubt the children cared what we sang or how we did it, but the rhythm moved them, and they continued to dance. We also sang the well-known “Andro Verdan,” popularized by the Soviet film “Gypsies Go To Heaven” (Tabor Ukhodit v Nebo) and then finished off with “The Lion Sleeps Tonight.” The students had had a long night in Krakow earlier this week, practicing this repertoire in a punk bar until the wee morning hours when they convinced a local restaurant owner to let them play a gig on June 6, 2012. As I look back on the settlement visit, we should have played our music outside, as well, which would have helped ease the situation when we asked the kindergarten principal to unlock the numerous doors and to let us out on the community side of the kindergarten to play soccer with the kids who were not part of the kindergarten. The idea was that the principal would introduce us to parents as they came to pick up their children from the kindergarten, and we could spend some time speaking to them. However, once the principal unlocked the doors and steel bars outside the kindergarten, she did not hang around to mediate – rather, I saw her later on the second floor, observing the situation through the window. Some of our students had a soccer ball, so they began a game. Slowly, more people became to come toward the grassy field, mostly young people who spoke to us out of curiosity. Little boys posed in front of cameras with hip-hop gestures and movements. Girls invited us to play jump rope made out of tied together pantyhose. Some older boys spoke English, and young mothers waiting to pick up their children from the kindergarten talked to us about the kindergarten. We played and talked with the people for about an hour, and then the police began to drive by. Any large group of Roma gathering brought about suspicion, and we realized we would have to disperse so as not to create any trouble for the community. The presence of the police seemed very vivid for the children, who played a game called “Polizai.” We also noted the figure of the policeman featured in some of the students’ artwork. We were shuffled back through the steel cage, back through the labyrinth of doors and escorted by the teachers through the kindergarten classrooms, and let out the back entrance. 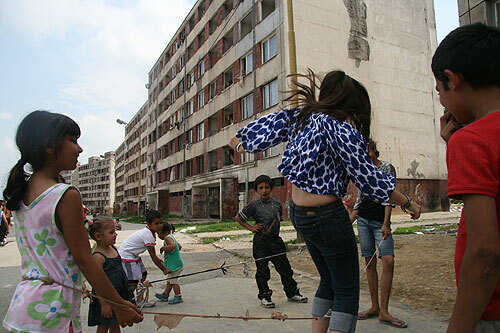 Young girls play with a "jump rope" made out pantyhose tied together outside one of the condemned housing projects in Lunik IX, an urban Roma community near Kosice, Slovakia. While the verdict is not out as to whether such a visit should continue to be included as part of the study abroad program, the students were visibly affected by it. Some said that if we had begun our trip in Slovakia, they would have not attended Khamoro concerts because those were not “real” Roma culture. They have realized that staged performance is one of the primary ways most non-Roma engage with Roma culture, but it is not the only reality. We began this program with a week at the Khamoro Festival in Prague where Roma performers from different countries engaged Roma and non-Roma audiences in colorful costumes with expensive instruments on technologically equipped stages. We traveled to Poland, where the trauma of the Roma experiences during the Holocaust put into perspective the historical roots of the present-day human-rights movements in the European Union. Our personal experiences with Roma were augmented by a private concert by Romanian Roma musicians at the Ethnographic Museum in Tarnow, Poland, dedicated to Roma identity. And yet, with all experiences geared toward understanding the ways in which policies and attitudes of non-Roma toward Roma integration influence Roma everyday experiences, it was not until we arrived at Lunik IX that all of these discussions hit home.